I Have A Fatigue Failure - Is That A Problem? I HAVE A FATIGUE FAILURE – IS THAT A PROBLEM? Each of us has experienced fatigue in our lives, a time when we were extremely tired, typically due to long or intense mental or physical exertion. It turns out that materials experience fatigue too, although not the mental kind. In the field of Materials Science Engineering or Metallurgy, the term “fatigue” has a very specific meaning. In the engineering sense, fatigue is a progressive failure, most often caused by the initiation and growth of a single dominant crack that occurs due to repeated, or cyclic, loading. Initially, when these types of failures were observed in the early 1800s, it was thought that the material got tired or fatigued, so the term “fatigue” was applied to describe these types of failures. 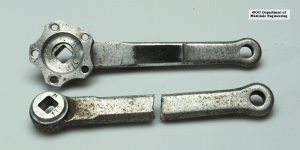 The photo on the left shows an example of a fatigue failure in a bicycle crank. The pedal attached on the right. Each time the rider pushed on the pedal, a load cycle was completed. After months or years of riding, the crank snapped. In the engineering world, a failure of a material typically occurs when the stress applied exceeds the strength of the material, and the material breaks in a single event. In fatigue, the failure occurs when the stress is lower than the strength, but it is applied repeatedly over a long period of time. If each cycle of loading and unloading is considered an event, there are many events before failure, sometimes millions. The most common example of fatigue failure is the paper clip test. When you bend a paper clip once, it doesn’t break. The stress was lower than the strength. But when you bend it repeatedly, say 5-10 times, it does break. That break is a fatigue failure. Note that in the paper clip test, the final bend of the paper clip was more or less the same as the earlier bends – that is, the final bend alone did not cause the failure. It was all the events leading up to the final bend. Many times, when the final fatigue failure occurs, witnesses place much emphasis on the conditions of the final loading cycle, when they may not matter a whole lot. It is the accumulation of damage long before the final fracture that causes fatigue. Whether it happened on Monday or Tuesday, or when Bill was operating the machine instead of Carlos, for example, is often arbitrary. Fatigue is preventable in the design stage. Of course, poor manufacturing can make fatigue failure occur unexpectedly, even with good designs, but generally (with exceptions), fatigue failure should not occur. If the designers know that cyclic loading may occur, they can prevent it with proper design and material selection. In fact, in most Mechanical Engineering educational programs, almost an entire semester is spent on designing to prevent fatigue. With steels, for example, components can be designed to resist fatigue theoretically forever. Since fatigue is preventable, the appearance of a fatigue failure is often indicative of a problem. So the answer to my initial question is “probably.” There are rare cases where it is not indicative of a problem, to be sure, but often it is. Typically, the problem is either one of design or one of manufacture. In design problems, either the designer did not foresee the cyclic loading, did not estimate the magnitude of the cyclic loading correctly, or chose the wrong material to resist the cyclic loading. In manufacturing problems, there is often a defect in the part which reduces its resistance to fatigue. Fortunately, we have methods to determine whether fatigue occurred and why it occurred. Using those, we can correct fatigue failure issues and minimize fatigue problems.